Increasing numbers of computer users are suffering from repetitive strain injury (RSI) as a result of using computer mice. Damage from RSI commonly manifests itself as shooting pains or burning sensations in the wrist and fingers, and mobility can be permanently lost if the condition remains untreated. 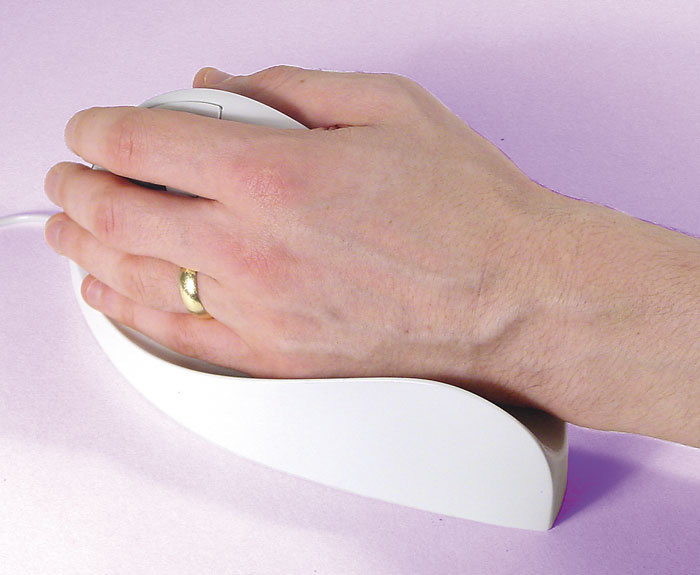 Not only does a normal mouse require a less-than-ideal hand position, it also encourages you to do one of the things most likely to cause RSI problems: moving your hand or fingers while they are tensed from holding down a mouse button. Designer Appliances have designed their Quill mouse to combat these problems. The hand's mousing position is rotated to a more vertical position closer to its natural resting position, and a contoured channel fits around the hand to allow mouse movement to be controlled by the larger muscles of the upper arm. The Quill connects to your computer via a six-foot USB cable (with PS2 adaptor), and drivers for both Mac and PC are included on a CD-ROM. The mouse uses an optical mechanism to detect movement, and there are two buttons and a scroll wheel (with integral push switch) positioned to fall naturally under the fingers. Although the Quill is quite large at eight inches long, I found that it felt rather cheaply built, although that does mean that it's lightweight and I had no operational problems. Both right-handed and left-handed versions are available. You need to use a larger space for mousing (and a slower mouse speed setting) than you might be used to, and it took me several days to regain my previous work rate. I was also initially concerned that the mouse pointer whisked off to the edge of the screen whenever the mouse was lifted for repositioning. However, when I asked about this, the manufacturer pointed out that it is less damaging to reposition the mouse relative to the pointer by butting the pointer against the screen boundaries, rather than by lifting it up, and I found that it was fairly easy to change my mousing habits in this regard. However, I saw no mention of this point in the packaging, and I know a user who abandoned the Quill for this reason. Now that I've acclimatised to it, the Quill does indeed put less strain on my mouse hand than a normal mouse, so I've now been using it permanently for several months. My only remaining gripe is that I feel that the comparatively sharp edge running across the top of the Quill from its point to its base could have been more rounded and comfortable. It's also worth mentioning that the Quill can't absolutely guarantee you trouble-free mousing, because you can easily use it incorrectly, just as you can slouch in a well-designed desk chair. However, if you're already suffering mousing pain, then this product could be the catalyst you need to find a new pain-free way of working. £80.99 including VAT and shipping. 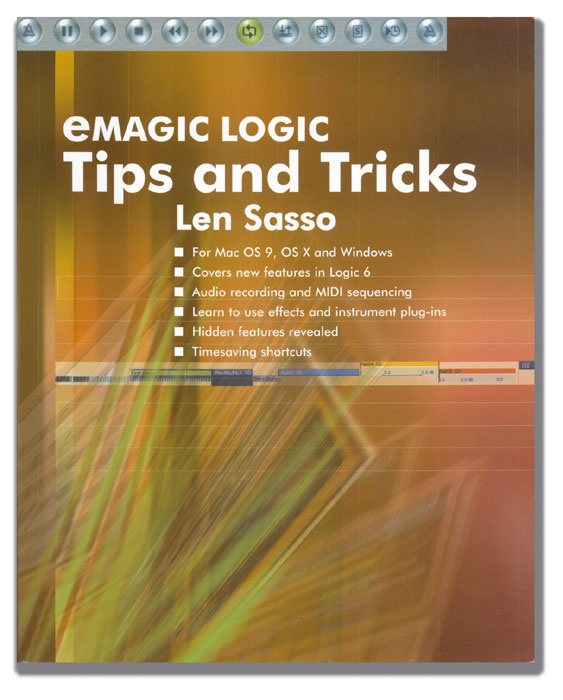 This new title from SOS Logic Notes contributor Len Sasso covers all aspects of the Emagic's sequencing platform, including many of the new features that were added to Logic for v6. However, rather than using his 130 pages to skim over the basic features of what is an immensely complex program, he wisely leaves most of the basic explanatory tasks to Logic 's own detailed documentation, concentrating instead on the most useful functions and how to get the best out of them in practice. The first couple of chapters advise on setting up Logic and using Screensets and Key Commands efficiently. After that, the tips are divided into chapters according to the different main sequencer windows, and there are also specific chapters on dealing with audio files and using plug-ins. This is a good strategy for a book such as this, as you can immediately find most of the relevant tips according to which window you're working in. In addition to the main chapters, there are three appendices: a nice little audio and MIDI setup troubleshooting guide; a complete list of default Key Command assignments; and a half dozen selected web links. Although this book hasn't been structured around tutorials, unlike some other titles, Len does walk you through some of his more in-depth techniques step-by-step — showing you, for example, how to carry out Recycle-like beat slicing within Logic, or how to future-proof your finished projects in case you want to remix them on another system at a later date. Len's writing style throughout is clear and concise, although 'concise' got the better of 'clear' in a couple of the shorter tip boxes. However, being too concise is something most writers can't even aspire to! I think that all Logic users will be able to take something from this book: beginners can quickly find out those bits of Logic 's functionality which will really speed up work flow, and more seasoned users don't have to trawl through acres of rehashed manual in order to get to the interesting bits. 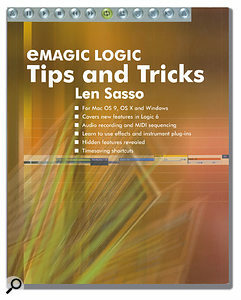 Emagic Logic Tips & Tricks by Len Sasso (ISBN 1592001351), £12.95 including VAT. PC Publishing +44 (0)1953 889900.